ICE Protest inside Philadelphia City Hall, Wednesday, July 25, 2018. A raucous group of Occupy ICE protesters held a City Hall stairwell for more than an hour on Wednesday afternoon, at points locking arms to block foot traffic and bumping chests with police officers who sought to clear the way. They left only after winning the promise of a Friday meeting with Mayor Kenney to address their demand for an end to all city cooperation with the federal immigration enforcement agency. "We got somewhere," said Xelba Gutierrez, 34, who helped lead the demonstration. "We want to make sure, as a sanctuary city, he keeps up with what it means." Shortly after 4 p.m., about 15 demonstrators left the stairwell and headed into the street, met by a chorus of horns. They circled City Hall once before returning to an encampment on the concrete curtain that surrounds the building. They had intended to stage a sit-down strike outside the mayor's office, but when stopped by police, they quickly claimed ground by the east-side elevators, blowing whistles, and shouting and chanting "Abolish ICE!" and similar slogans. Some people trying to do business in City Hall were kept from passing. Others retreated and made their way up or down the stairway. 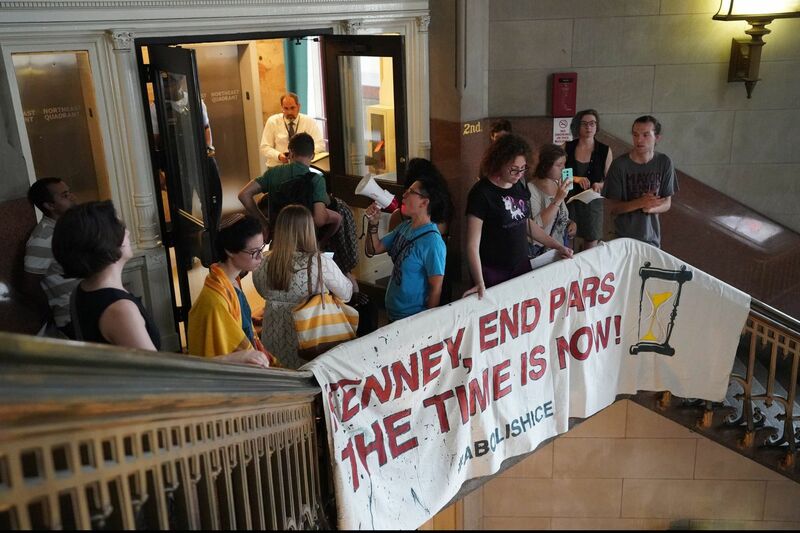 Organizers wanted to confront Kenney with a demand that the city withdraw from an agreement that allows ICE access to a real-time police database known as PARS. Two protesters were allowed into the mayor's office to deliver a letter on the matter. Mayoral Communications Director Deana Gamble confirmed that a meeting with a delegation of demonstrators has been set for 3:30 p.m. Friday. The mayor will announce his decision on PARS before the Aug. 31 deadline, she said. Having gathered and shared information on PARS and ICE with key constituencies, she said, "we are now focused on deciding whether renewal is in the best interest of the city and its residents." The demonstrators never got within 30 yards of Kenney's office, blocked by locked hallway doors and a phalanx of police. PARS, or Preliminary Arraignment Reporting System, is a real-time computer database of arrests, operated by the city and, via contract, shared with ICE. That tracking system became central to a protest that evolved outside the ICE office in Center City this month, where pro-immigrant demonstrators demanded the city government cancel the agreement when it expires at the end of August. Police arrested 36 people during two days of demonstrations at Eighth and Cherry Streets. Cleared from the street and corner, a small band of protesters set up a new camp on the east side of City Hall. The actions come amid a growing national call from immigration advocates to abolish ICE, with some Democrats saying the agency has become a deportation force that targets black and brown people. In response, some Republicans say eliminating ICE would mean abolishing U.S. borders and opening the country to crime, drugs, and terrorism. The Philadelphia Occupy ICE protest has been organized by groups including Philly Socialists and the Democratic Socialists of America, and supported by Juntos and Asian Americans United, among others. Nationally, propelled in part by social media, Occupy ICE has reached about a dozen cities, including New York, Atlanta, San Francisco, Detroit, and Portland, Ore.